Ideally, horses’ lives should be marked by the best care possible from their owners, and a place to live as beautiful and bountiful as the above scene in Virginia. 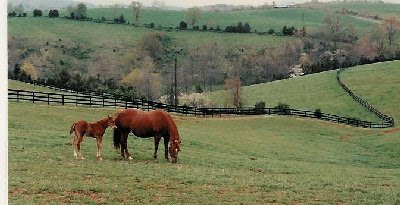 Those horses were my mare and her son at the farm where they lived. But as I have often written, some horses, especially Tennessee Walking Horses, suffer torture by their owners or trainers so the animals will walk in a contorted, exaggerated, unrealistic gait for the show ring. The gait is marked by the horses lifting their legs unnaturally high, because they are afraid of again experiencing the pain their owners have inflicted upon them. Many people who attend a Walking Horse show don’t realize this; they think that this abnormal gait has been achieved through normal training. These horses are victims of soring. Their legs have been treated with caustic agents; they have been made to wear stacked shoes; often trainers have placed irritants under their saddles which constantly remind them, with pain, that they have to lift those legs; and they are treated to other horrifying techniques honed by years of mistreatment by men and women who only care about prizes, money, and prestige. These horses are forced to remain in their stalls without the pleasurable experience of grazing, like the horses above, and it is thought by some experts that some Walking Horses’ lives are cut short by all they have to endure. I have written here about the horse protection organization, Friends of Sound Horses. This brave group brings all its resources to getting rid of soring, once and for all. The Sound Horse Conference will be held November 5 and 6 in Louisville, Kentucky. My brochure lists the following as just some of the topics that will be discussed: Pressure Shoeing, True Life Stories, Veterinary Research on Customary Practices for Tennessee Walking Show Horses, Detection of Soring, Legal Developments Affecting the Horse Protection Act, and Second Careers for Show Horses. The panelists will be comprised of veterinarians, judges, trainers, attorneys, and volunteers. All of these speakers are, of course, dedicated to ending soring. I’m going, and hope to see you there. For more information about FOSH and the conference, go to http://www.fosh.info/ and http://www.soundhorseconference.com/. And while you’re at it, why not join FOSH and volunteer your services? Horses can use your help. This entry was posted in Soring and tagged Soring by MMFisher. Bookmark the permalink.